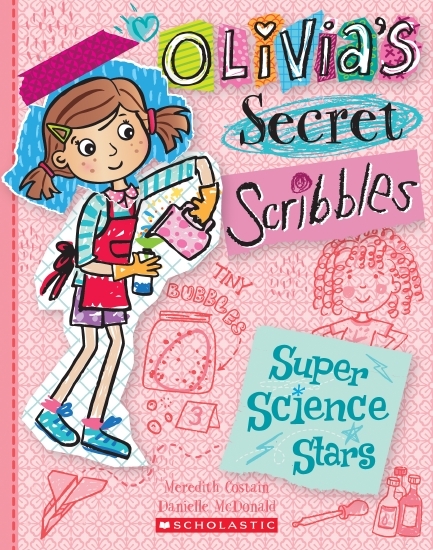 Super Science Stars is the fourth book in the Olivia’s Secret Scribbles series. It has an engaging storyline built around Olivia’s group project for the school science fair plus light-hearted fun and it explores emotions common to children in primary school. Visual elements include Olivia’s scribbles, daily written entries, drawings and diagrams. It’s school science fair time, and the biggest question is what to make? Olivia’s group have quite a few fun ideas. A volcano, a time machine and gooey slime are a few of the concepts which are thrown around, we even get to see some of them played out. Olivia shows mixed emotions when it comes to the new girl Bethany who is confident and kind of steals Olivia’s glory in a few situations. A gentle reminder from Olivia’s BFF (Best Friend Forever) Matilda helps to ease some of her concerns and in time a positive outcome and message prevail. Meredith Costain continues to impress with her ability to write for and accurately portray the thoughts and emotions of primary school age children. Danielle McDonald has done a fabulous and fitting job of illustrating on behalf of Olivia’s character. Super Science Stars has lots of pink illustrations throughout, fun science experiment ideas and includes a range of relatable topics for young girls.